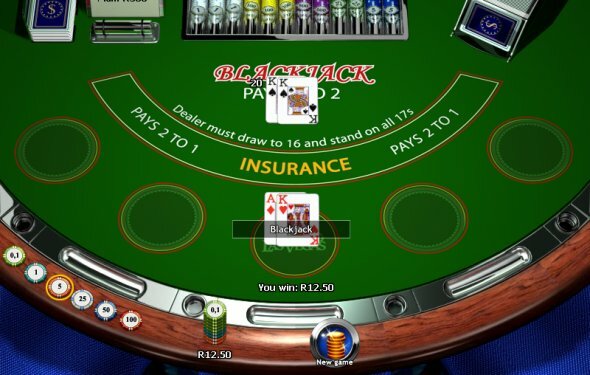 Blackjack, also known as 21 is one of the most popular casino card games in Las Vegas. The rules of blackjack are quite simple, which is a major reason for the game's enduring popularity. In Las Vegas casinos, blackjack is played on a semi-circular table, with the roundportion of the table facing the players, and the straight edge side facing the dealer. There are usually five to seven seats at a table and every blackjack table will have the words, "Insurance Pays 2 to 1", also, "Dealer must Hit Soft 17" or "Dealer Must Stand On All 17's". Read about the differences in the two version on the right column of this page. Find an appropriate bet-limit table and place a bet by the chips in the designated area. Depending on how many people are playing, the dealer will deal each player two cards. The dealer is also dealt two cards, one face up, and one face down. The following cards Jacks, Queens and Kings are worth 10. What are the face value of cards in blackjack? Face cards (Jacks, Queens, Kings) all have values equaling 10. Aces can count as either 1 or 11, whatever will make the best hand.